Take an ordinary suit and turn it into a fashion statement when you wear this red suit vest. A suit vest isn't just some garment you wear but a fashion statement and way to change up your entire ensemble. 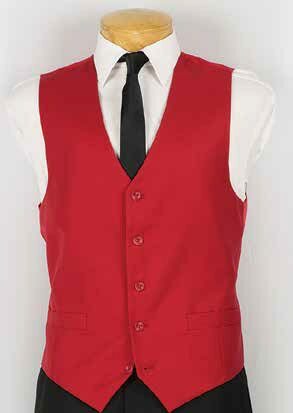 This red suit vest features easy to wear style in the classic suit vest look with it's 5 button front. Once your wear this classy red suit vest, you just many be adding more to your selection. Made of fine poly/rayon.